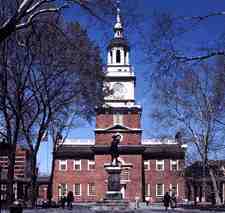 Independence Hall was built in 1732 as the Pennsylvania State House. It is the birthplace of the United States. Within its walls, the Declaration of Independence was adopted, and the Constitution of the United States was debated, drafted and signed. An interesting side note is the basement once served as the city dog pound. The bell rang many times, but the one most remembered was when it rang to announce the first public reading of the Declaration of Independence. The bell cracked shortly after it arrived in our country from England; was repaired and cracked again. It has not been rung since 1846. The Liberty Bell weighs 2000 pounds and is made chiefly of copper and tin with small amounts of silver and gold. 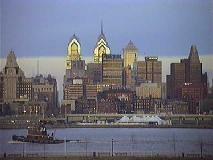 Philadelphia, the city of Brotherly Love, is Pennsylvania's largest city with a population of about 2 million. Philly (as the natives call it) will host the 2000 Republican National Convention. One of the three United States mints is located here. 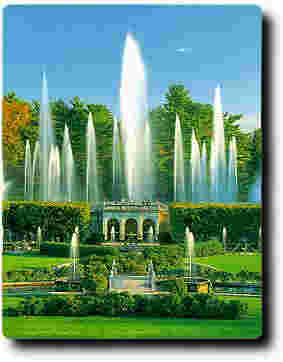 Philly boasts the largest landscaped city park in America - Fairmount Park - with over 4,180 acres. 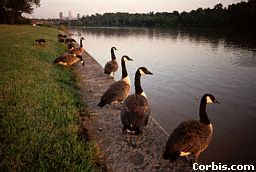 These Canada Geese sure are looking longingly at the Schuylkill River. There are museums, theatres, some of the finest restaurants in the country. So much to see, but we have the rest of Pennsylvania to tour, so we'd better be on our way. Welcome to the world's premier horticultural display. 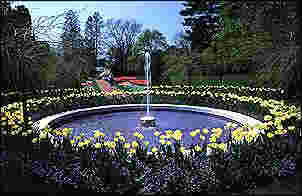 The park was created by Pierre S. duPont and offers 1,050 acres of gardens, woodlands and meadows. 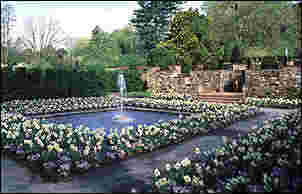 No dialogue is necessary to explain the beauty of these gardens. 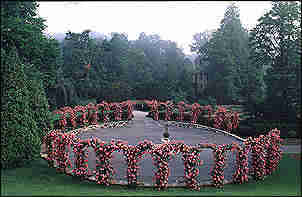 Let's take the Flower Walk Tour. 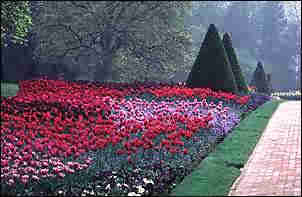 Let's continue our walk through these lovely gardens. No, the weather hasn't changed. 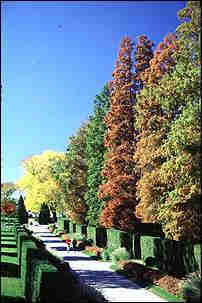 I wanted you to see that Longwood is just as beautiful in the Winter as it is in the Spring and Summer. Well, we've gone just a short distance out of our way, but I think the trip was worth it, don't you? Let's see if the Chevy can find the turnpike. After a short 25-mile drive, we've arrived at VALLEY FORGE. There was never a battle fought here. General George Washington chose this site as a winter encampment in 1777-1778. This is Washington's Headquarters. Officers gained quarters in local farm houses where they could plan their Revolutionary War strategies for Spring. 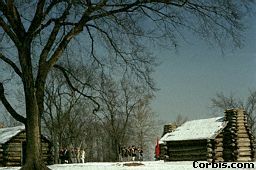 When the 12,000 members of the Continental Army arrived in Valley Forge that bitter winter, after a defeat at the Battle of the Brandywine, they had only old, cracked tents for protection until some of these cabins were built. They didn't offer much more protection and 2,000 men died from disease that winter. We're headed up the Pennsylvania Turnpike to the POCONO MOUNTAINS. 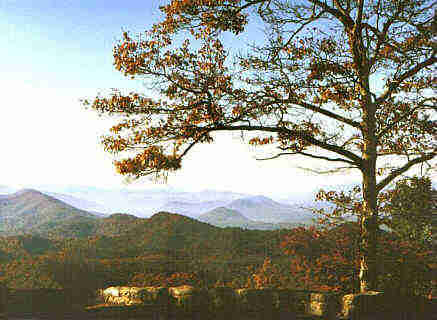 The serenity of these beautiful mountains will give us a nice respite. The Poconos have been maintained, in large degree, in their natural state. 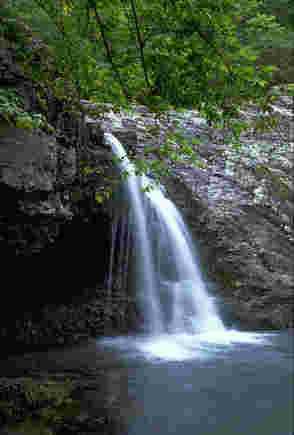 There is a myriad of waterfalls in the Pocono Mountains. There are many different sizes and heights with enough variation to please anyone. As much as we'd like to linger here, we'd better head toward central Pennsylvania. This is Wellsboro, one of the prettiest towns in the Pennsyvlania mountains. 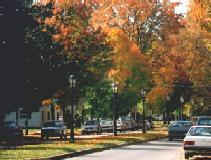 It's a quaint town with a gas-lit main street, stately trees and well-kept Victorian mansions. 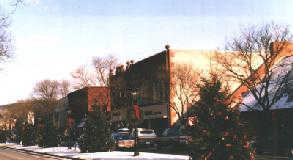 Founded in 1806 by New England colonists, Wellsboro is also an all-year recreational area. 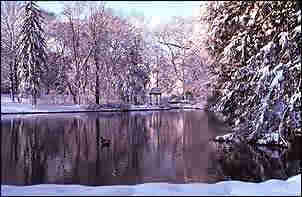 This is one of the seven lakes in the area. 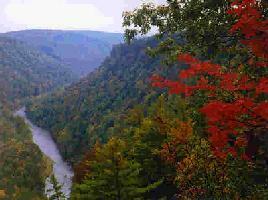 Pennsylvania's Grand Canyon. 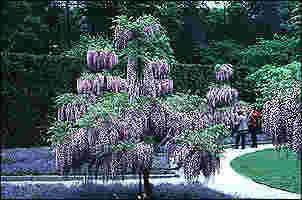 It is a showcase of wildlife and scenery. The maximum depth is 1,450 feet and it is about 4,000 feet wide from rim to rim. 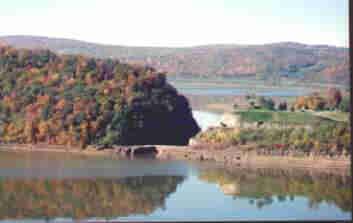 Leonard Harrison State Park and Colton Point State Park are located on opposite sides of the canyon. 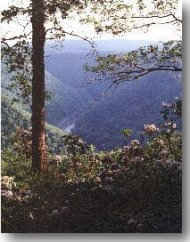 Pine Creek carved the canyon and flows 47 miles through it until it meets the Susquehanna River. Click on the license plate, and we'll be on our way.